I’ve read countless personal finance and investing books and articles that advise you how to save more money. …but how much do you spend? Inspired by a recent article on Big Cajun Man’s site, showing this same Stats Canada infographic below, I figured I’d share some of our household expenses and make some comparisons for kicks. (Note: my numbers account for the 2016 calendar year). Shelter/Mortgage – not including any mortgage prepayments we spend 14% of our net income on our mortgage. If I include our household utility bills, that number climbs to 20%. If I then include our property taxes that’s now 24% of our net income to live in our home. Household operations, furnishings and equipment – we’re pretty happy with our furniture and other belongings in the house, but is this figure includes general home maintenance and small renovations; landscaping; gardening; snow removal, etc. then I would say we spend close to 10% of our net income in this category. Recreation – we figure this accounts for about 10% of our net income. We take at least one major vacation every year, if not two. We also attend many festivals and sporting events every year. Food/groceries – we try and eat well in our home. Based on our monthly budget we spend about 8% of our net income here. Transportation – we don’t have any car payments, we own both vehicles. We drive predominantly one car however. Insurance for both vehicles is close to $1,500 per year. After I add in maintenance costs and licensing we spend about 5% of our net income on transportation. Clothing and accessories – we figure this accounts for about 4% of our net income. Health and personal care – this is probably close to 4% of our next income. Alcohol, tobacco and games of chance – we drink craft beer and we like nice wines. We don’t smoke and we don’t gamble. This amounts to <2% of our net income. Education and reading materials – I have a few online subscriptions but that’s about it. <1% of our net income here. Our average expenditures are less than $60,516 but not by much (again, our figures are from 2016 not 2015). Although our expenses are likely more than most couples, I know our savings rate has gone up in recent years thanks to lower transportation costs/expenses (no car payments since late-2016) and smaller mortgage payments. Once the mortgage payments are gone (within 5 years?) we anticipate some significant cash flow can be diverted to investments and/or we’ll work less. Not cheap but it’s not surprising to me; we spend more than average here. We have two cell phones in our house and one VOIP landline. The latter (VOIP) costs us about $5 per month. We’ve recently adopted two cats. Lovely guys so far. However, I can tell you for a fact they cost more than $590 per year. $590 per year might not even cover their food bill; that’s only $49 per month. 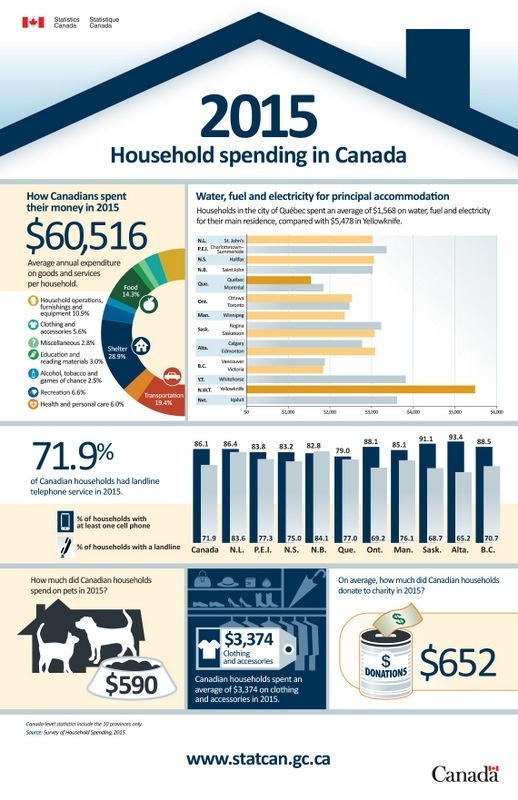 The major household expenses for Canadians continue to be shelter, transportation and food. For what I can gather from our expenditures, if we can keep our mortgage costs low (to non-existent) we’re be doing much better financially in a few years. If we can continue to keep our transportation costs to a small portion of our net income that will also accelerate financial independence. This will mean any money we make can be largely enjoyed after mandatory household operating expenses are paid. What are your household expenditures? Ever done the math? 27 Responses to "Compare your household expenses here "
That’s a healthy (pun intended) fitness and fun budget. I suspect our savings rate for investment purposes is nearing 30% net income. If we can get it to 50% after the mortgage is gone we’ll be comfortable…something to strive for. You seem to have a great balance…well done. Even by German standards our costs are low. Part of it is that we moved back into our own place and before moving we gutted and renovated with the idea of being more efficient. LED lights throughout, A+++ rated appliances window blinds to not only for shade but to keep the heat in at night. It’s also a 1 bedroom which also helps keep the costs low. Property Taxes: 350€ A YEAR yes ridiculously cheap!!!! TV: approx 50€ bit on the high side but I pay extra for English TV. A few more odds and ends but in total I budget 850€ month for all costs. My everyday spending runs between 850 and 1200 a month depending on how much the dog costs us!!!! Animals can be ridiculously expensive! Between the vet, the dog tax and stocking up on food and treats this month it was over 300€!!!! Once the mortgage is gone (4 years 2) months and ignoring dog cost (wife agreed this will be our last one) I expect we could love a very nice life on under 1500€ a month! Oh one other thing, asked something who moved to the states, how costs compare and quite unexpectedly he said it wasn ‘t cheaper. If anything due to a booming economy and lack of rent control it costs a bit more? Yeah like I said, even for Germany this costs are pretty low, but then we live in a small well managed condo and thst does make a difference. I guess so!! 🙂 Well done Rob. (FYI – just got our first property tax install bill for 2017. $2,000 now. Owe another $2,000 in June). Canada and Ottawa is not cheap. Slight edit: my internet cell phone package is approx 50€ rising to 65€ next year, I had a credit kick in last month. Still quite reasonable. We have LEDs everywhere and very energy efficient appliances. Our hydro is on average about $125 per month. We have unlimited internet for $65 per month which I think is good. Your property taxes are crazy low. We’re close to $380 per month for 2016. Cool infographic – kudos to StatsCan for collecting and publishing useful data like this. When I looked at it I had two immediate thoughts: 1) Total spend of $60k seems really high – I thought household incomes were lower than that, especially when you consider the second point: 2) Where are taxes? Well, StatsCan has various measures of income (total average income in 2011 by family unit was $95,000, with median being $78,870), and average after-tax income was $79,600, so total spending of $60k fits within that. The total expenditure tables include the missing taxes, as well as gifts of money and spending on insurance. Well…that’s our spending after taxes. Our tax rate is north of 30%, close to 40%. If you start with gross…income taxes are by far our biggest expense. -Vehicle costs (gas, car insurance, and maintenance) are $332 per month. -Eating is out is costing us $370. Interesting that this is even more than we spend on groceries, and yet by far most of our meals and calories are consumed at home. I really like the fact that you included percentages; I am going to go and do that next time around as it gives a sense of where each category fits into the bigger picture. Thanks! Mortgage and property taxes seem low but that might be because we have too much house compared to you!! We don’t have any daycare but your expenses are far from trivial. Thanks for sharing! Re: “Mortgage and property taxes seem low but that might be because we have too much house compared to you!!”. They are extremely low, mostly due to the fact that we bought half the house we could have (which has the double benefit of lower mortgage payments AND half the property taxes), in combination with 2.1% interest rate on the mortgage. I still can’t believe interest rates are so low. But good to remember that you get hit on the other end of things with gov bonds and GICs paying basically nothing (and often less than nothing when you factor in inflation). How long does AZ vacation last? A month or so cannew? Also, that seems very low for food….you spend less than $100 per week every week? If so, wow. We’re only two and our grocery budget is $125 per week. We spend 3 to 4 months in AZ (we find it extremely inexpensive to live there). Yes, our food expenses have dropped, as we eat much smaller portions than we did. Eating out we split a small portions and even then seem to bring doggie bags home for another meal. Geez, that grocery bill and travel bill to AZ is great then. Very well done. Just ordered an OOMA today. Will be cancelling the TV service too, but need to do a little research first. I’ve heard good things about OOMA. What’s the operational cost? I might be posting an update on VOIP soon. I’ve been using Fongo for 2.5 years. They say $4 a month. I will let you know. I am on Rogers as well. I think they will still pay dividends for many years to come. As will BCE, Telus and Shaw. Just a guess though, the future is always cloudy! Great post and interesting to see some other people’s numbers. Our expenses always seem to be creeping up. This is for a couple in a condo with most, but not all, of my spouses expenses included. Total (also including some miscellaneous and unaccounted expenses) about $6750 per month average for 2016. One focus this year is on reducing the catch all ‘household operations’ which last year included several furniture items and our ‘electronics’ account which included a new laptop but lifestyle inflation is a real issue! Interesting numbers Alan. Thanks for sharing. I hear you with the “cats” expenses!